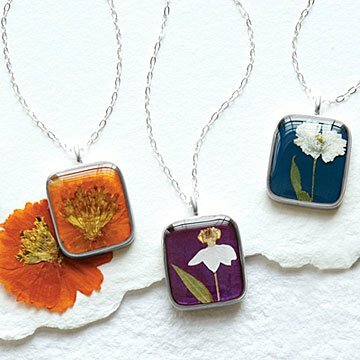 Celebrate your birth month with the symbolic, wearable bouquets of these unique dried flower pendants. Most of us know our Zodiac sign and our birthstone, but did you know that each month has its own birth flower too? These blossoms carry just as much meaning as the stars and stones and keep individuality in bloom with each dried, pressed bud captured in a resin pendant by Shari Dixon. Sourced from around the world, each flower is specially picked for its delicate beauty. Set in a silver-plated brass bezel, with a sterling silver chain. Handmade in Tennessee. Please check out our Birth Month Flower Earrings and Birth Month Flower Cuffs from Shari Dixon. Shari Dixon began her career as a silversmith, but over time has adapted her line to include natural elements she finds inspiring. She has also merged her graphic design training with a strong background in fashion, creating a line of jewelry that's timeless, stylish, and reflective of the passion that jewelrymaking brings to her life. Her motifs incorporate natural elements such as flowers and leaves that are sealed in resin, which preserves the form and immortalizes their fragile, otherwise fleeting lives. Wipe gently with a polishing cloth. The orientation of the flowers in each pendant may vary slightly. Just so pretty and unique. Daughter loves her new necklace. Beautiful piece of jewelry; however, the chain is too short. I don't see how to remove it from the chain without ruining it. I feel it would be for versatile if it was on a longer chain. These are beautiful and unique. My girlfriends and I all love them! The quality is excellent. You can wear them with a t-shirt or dressed up. They're very versatile. The length is perfect and adjustable. Great gift! The chain is cheap and broke immediately. Pretty pendant though, I love the idea. This is a pretty necklace, good for someone who likes bright accents to business attire. I was very impressed by the unique design and the quality of the workmanship. What an impression it made on my granddaughter 16th birthday. Thank you, you made a grandmother proud. Order this for my niece who just turned 4. I wanted to get her something unique that she could grow up with. When she looks at this necklace she will always remember her 4th birthday. I can only say that the recipient likes it very much.